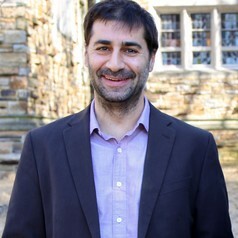 Aram Goudsouzian is the chair of the Department of History at the University of Memphis and the author of Men and the Moment: The Election of 1968 and the Rise of Partisan Politics in America, forthcoming from the University of North Carolina Press.He earned his PhD from Purdue University and his BA from Colby College. He teaches courses on modern American history, with a particular focus on race, politics, and culture. His book Down to the Crossroads: Civil Rights, Black Power, and the Meredith March Against Fear (Farrar, Straus, and Giroux, 2014) won the McLemore Book Prize from the Mississippi Historical Society. He is also the author of two biographies of significant popular culture figures during the civil rights era: King of the Court: Bill Russell and the Basketball Revolution (University of California Press, 2010); and Sidney Poitier: Man, Actor, Icon (University of North Carolina Press, 2004). He wrote another short book called The Hurricane of 1938 (Commonwealth Editions, 2004) about the costliest natural disaster in American history until that time, and he has written articles in journals such as The Journal of American Studies, Study the South, Journal of the Historical Society, and American Studies. He is a regular contributor to Chapter 16, the online book review journal of Humanities Tennessee, and a frequent book reviewer for the Washington Post.